Now for our first idea of how to stop Barry Bonds. We have a few favorite baseball players. Number one on the list is Hank Aaron, of course, but there are more who will hopefully aid us on our quest to save the world. 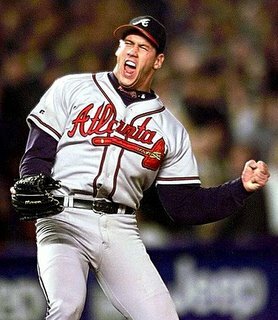 The first guy that could help us is Ritty's favorite Brave's pitcher of all-time: John Rocker. The Mouth of the South. We aren't worthy enough to have ever met the guy, but we are about 99% sure John Rocker HATES Barry Bonds (His feature is coming soon, don't worry). So how could this guy stop Barry Bonds from getting anywhere near 755 home runs? Easy. If John Rocker pitched to Barry Bonds every single at-bat, the guy would probably hit like 5 or 6 bombs all year. Maybe. And that would probably only be if Rocker was sober, which we hope is very rare. Very rare. He might break all of his Walk records, but who cares. If he walked everytime he stepped up to the plate the world wouldn't blow up. But ch ances are Rocker would bean Bonds 9 times out of 10 because like we said before, Rocker HATES Barry Bonds. We hope. This would serve two purposes. One, Barry couldn't go yard if Rocker is ricocheting 95 mph fast balls off Barry's knee caps, and two, Barry's knees would eventually give out anyway. Rocker hates Bonds but he also HATES knee caps. Probably. And by the way...our man Rocker is going to be on that new show Pros vs. Joes . Should be awesome. Now if we can only get him to follow the Giants around the country only pitching to Bonds. I have been out with your man Rocker a few times; and yes, he does hate Barry effing Bonds. He has told me that on a few occasions. He isn't a big fan of Piazza either. You know who else hates Barry Bonds. Mr. CHUCK NORRIS. And he could do something about it. Try a round house kick to the knee caps for starters. I like Rocker, despite his not-so-goood stint with my Rangers, but his website is pretty funny. At least he has a hot publisist. As Rocker's publicist, I have to admit that I don't know of any animosity towards Bonds. I'll be sure and forward your blog to John. Cool concept either way.